"‘I don't want this life': 10 Palestinians shot dead by Israeli army on Gaza border," read a Washington Post headline from Friday. That headline—later changed with updated figures to a more neutral: "Fifteen Gazans dead after Israeli army, Palestinians clash at border fence, officials say"—used part of a quote from 22-year-old Yahya Abu Assar, a Palestinian living in the Gaza Strip, who added, "I want to be shot." The Post‘s use of Abu Assar's quote portrays a situation in which Israel ruthlessly oppresses the Gazan people and is largely responsible for their ills. Such a portrayal is false and irresponsible, yet all too common among prominent media outlets covering events in Gaza over the past few days. Abu Assar was one of some 30,000 Gazans who massed along the Israeli border on Friday for the start of the Great March of Return, six weeks of planned mass demonstrations against the Jewish state. The demonstrations were billed as peaceful protests, but rioters in Gaza burned tires, tried to damage and breach the security fence, threw rocks and firebombs at Israeli soldiers on the other side of the fence, and even opened fire on them. An Israel Defense Forces (IDF) spokesman said the military faced "a violent, terrorist demonstration at six points" along the security fence and used "pinpoint fire" only to target those threatening the fence. Israeli ambassador to the United Nations Danny Danon insisted that the IDF only fired on the "main instigators" of violence. Israel had dropped leaflets in Gaza in the days preceding the demonstration warning that people who came too close would risk being shot. The Palestinian death toll rose to 18 on Monday, and prominent media outlets portrayed the border clashes as Israeli soldiers using disproportionate force to murder peaceful civilian activists. "‘He had no gun, no Molotov': Gaza families call for investigation into Israeli use of fatal force," read another Washington Post headline. Numerous other publications—such as the New York Times and Reuters, among others—depicted Israel as a stubborn thorn in the side of the righteous United Nations and European Union, both of which called for a special inquiry into the clashes in Gaza. Contrary to this narrative, the Israeli army on Saturday identified at least 10 of those who its soldiers killed as members of Palestinian terrorist groups—including Hamas, which rules Gaza. Hamas even publicly acknowledged that five of those killed were members of its military wing, the Izz ad-Din al-Qassam Brigades. And Islamic Jihad identified an 11th person killed as one of its members. These facts seem to fit with Israel's claim that the demonstrations, which Hamas led, are a front using civilian cover to launch attacks against Israel. 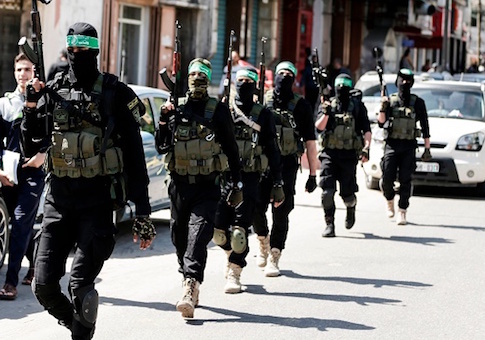 Hamas, whose founding charter calls for the destruction of Israel and the killing of Jews worldwide, has previously used human shields to further its military objectives against the Jewish state. Israel on Friday accused the terrorist group of sending a seven-year-old girl to the security fence in an apparent effort to provoke Israeli forces to shoot her. "When the IDF troops realized it was a girl, they picked her up and made sure that she could get back to her parents safely," the army said. "Hamas cynically uses women and children, sending them to the fence and endangering their lives." The army did not provide evidence to show that Hamas sent the girl, though Hamas leader Ismail Haniyeh said Sunday that he is proud of Palestinian children who participated in the Friday protests and "bravely challenged the Israeli military." Senior Hamas officials also warned that future demonstrations will go further than those on Friday and surprise Israel. "Last Friday we stopped at the border," Haniya said. "Next time we don't know where the limit will be." "Our people are capable of defending themselves," said former Hamas leader Khaled Mashaal. "In the past, the enemy was used to rockets being launched from the Gaza Strip. But this time Gaza surprised [Israel] with something new, and there's more in stock." Yahya Sinwar, the Hamas leader in Gaza, added that the "March of Return will continue … until we remove this transient border." Of course, many Western outlets did not report these comments. Perhaps more striking than the reporting on Friday's demonstrations is how many journalists effectively ignored basic history of the situation in Gaza. Take the aforementioned Washington Post article with Abu Assar's quote. "Palestinians in the sealed-off Gaza Strip—the vast majority of whom are denied permission to leave—say life is becoming unlivable," the story reported. "Unemployment among the population of 2 million is estimated to be pushing 50 percent and even higher among Gaza's youth. There is electricity for only a few hours a day." "The United Nations has warned that Gaza is on the brink of economic collapse and a complete breakdown in services," the Post added, before noting the "tight restrictions" that Israel has put on the "movement of goods and people." Why wouldn't Gazans storm the barricades to protest such persecution at the hands of their Jewish oppressors? There are two major problems with this narrative. First, Egypt controls who and what enters and exits Gaza's southern border, not Israel—a point the Post does not mention. Second, Israel pulled out of Gaza years ago, turning over every inch of the land to the Palestinians. The Post makes brief mention of this, but only in the 23rd paragraph of a 28-paragraph piece. The Post presented that tidbit as a side note, as if it is barely relevant. But it is relevant. In August 2005, Israel unilaterally withdrew from the Gaza Strip under the orders of then-Prime Minister Ariel Sharon, evacuating all Israeli troops and civilians and uprooting more than 8,000 Jewish settlers—some of whom were forcibly evicted. But Jerusalem did not implement a blockade; instead, it wanted a Palestinian state in Gaza to succeed. Israel left 3,000 greenhouses, which produced fruit and flowers for export and could have aided the new Gazan economy. But shortly after Israel left, Palestinians looted dozens of greenhouses and walked off with irrigation hoses, water pumps, and plastic sheeting. Hamas then seized control of Gaza in 2007 and has governed, unsurprisingly, as one would expect an Islamist terrorist organization to govern: not well. Israel only imposed a blockade when Hamas smuggled weapons into Gaza to fire at Israel, including thousands of rockets. But Israel still facilitates the transfer of significant quantities of humanitarian and other forms of aid into Gaza from the United Nations and others. The media do not seem to realize that, when Hamas talks about breaking through the Israeli security fence and ending Israel's "occupation," the group by definition cannot mean Gaza. The only entity that occupies Gaza and oppresses its people is Hamas itself. The real intent behind the demonstrations, and all of those people who support them, is to oppose Israel's occupation of … Israel. The objective is to take over Israel and erase the Jewish state from existence. Perhaps if more journalists take the time to understand this point, they can better recognize where morality exists in this terrible and unnecessary conflict. This entry was posted in National Security and tagged Gaza, Hamas, Israel, Media, Media Bias, Terrorism. Bookmark the permalink.